This month’s Progressive Eats event is being hosted by Heather from the blog All Roads Lead to the Kitchen and Heather has chosen for her theme to have a Pretzel Party. Now…I have no say in what one of our team members picks and this one had me flummoxed for a bit. I’m just not a big pretzel fan. If you see someone hunched over that bowl of Chex Mix picking out the pretzels…that would be me! I might enjoy the perfectly baked version from the mall (and I’m betting some of our contributors) but the normal crunchy pretzel? Not so much. Still with a bit of an observation and a twisting of my own arm I think I did the pretzel proud with this Chocolate Peanut Butter Cheesecake with Pretzel Crust. When I finally had a moment of clarity I realized that pretzels appealed to me more when they are combined with sweet elements. I LOVE these Bacon Wrapped Pretzel Rods with Brown Sugar and Cayenne Pepper. I wanted to hide my updated version of The Strawberry Pretzel Salad when I made it, it was that good. So it seems I do like pretzels OK… I just need some sugar! While I love cheesecake, I prefer it relatively simple. This Lemon Cheesecake is my all time favorite but I have made a few others that I enjoy too. I’m not big on piling them with candy from the checkout lane at the grocery but I was OK with making one that mimicked my favorite candy bar. I suppose I could have called this a Reese’s Peanut Butter Cup Cheesecake except for the pretzel component so there really is no namesake; it’s just a really nice, rich cheesecake with a decadent ganache topping all surrounded by the slightly salty and crunchy pretzel crust and the whole thing is garnished with some peanuts and pretzels. 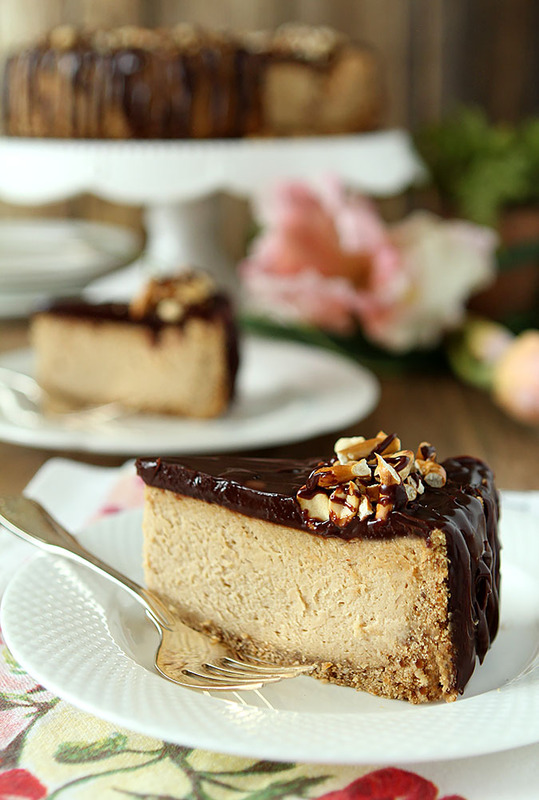 Sort of a ‘Take Me Out to the Ballgame’ cheesecake; so perfect for summer! If you’re thinking YUM at the thought of this Chocolate Peanut Butter Cheesecake with Pretzel Crust…you would be right. I’ve never got a lot to say in my blog posts; I really just want to share a great dish with you but tonight I’m exiting even sooner. I was a bit too social this past weekend to get this post done (and I plan to do that more often!) and then tonight? After I had 95% of my post completed I lost power for a second and everything disappeared. Preheat oven to 350°. Grease a 9- or 10-inch springform pan. Combine pretzels, melted butter, brown sugar and salt until well mixed. Transfer mixture to prepared pan. Press evenly into bottom and up sides of pan. Place cream cheese and both sugars in a large mixing bowl or the bowl of a stand mixer. Using a handheld or stand mixer on medium speed, beat until smooth. Mix in sour cream and vanilla extract. Add eggs, one at a time, beating well after each addition. Add peanut butter and mix thoroughly. Pour filling into crust and spread evenly. Reduce oven temperature to 200°. Bake for 2 hours, or until the center is firm and the cheesecake no longer looks shiny or wet. Remove cheesecake from the oven and run a knife around the edge of the pan. Off the heat add the chocolate and whisk together with cream as it melts. Pour onto top of chilled cheesecake and spread to the edges; reserving excess for drizzle. Mix together the peanuts and pretzel pieces and garnish the outside edge of the cheesecake. 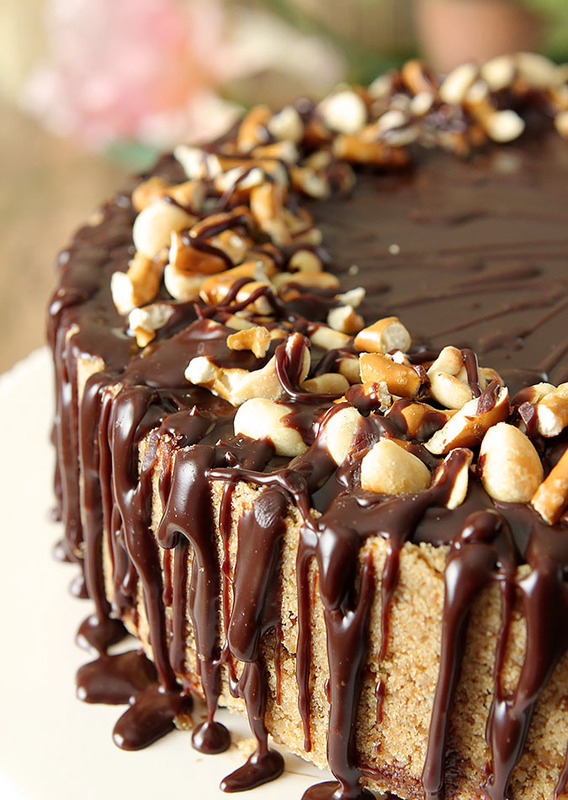 Drizzle ganache over garnish and down sides of cake. Return cheesecake to the fridge until the ganache sets, about 30 minutes. To Serve, slide large knife into very hot water and cut a slice. Clean off knife, slide it into water again and repeat. I used half dark chocolate and half milk chocolate for the ganache but use what you prefer...all dark or all milk or a mix like mine. All personal preference! Thank you so much for this delicious recipe! So wonderful! The contrast between the sweet and salty, the creamy and the crunchy, makes this a delightful dessert! So glad to hear you enjoyed it; it was a huge hit here too and now I want to make it again! Close to 2 years ago I first made your lemon cheesecake. Every time I serve it people really enjoy it. Today, my grandson and I made your Chocolate Peanut Butter Pretzel Cheesecake. It is truly a wonderful cheesecake. The peanut butter is evident in the filling. 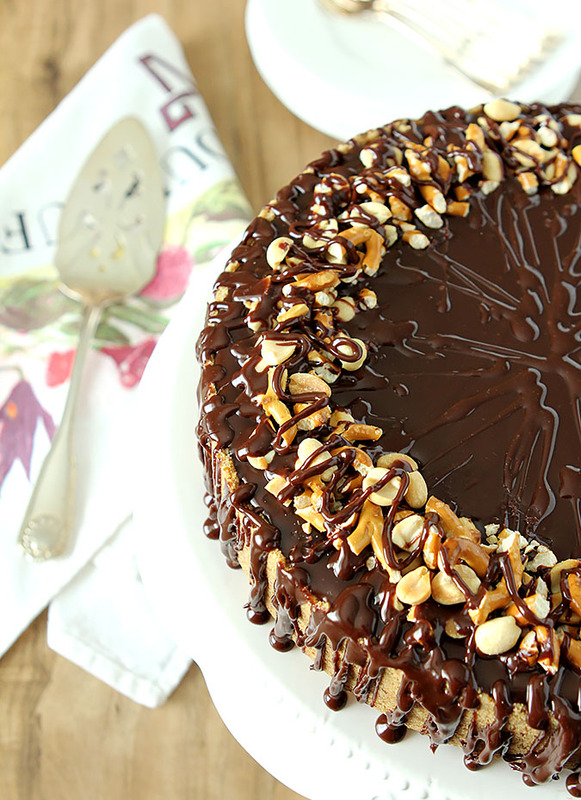 The peanut & pretzel garnish topping the chocolate ganache is pure heaven. Thank you for another outstanding recipe!! Thank you Julie for taking the time to let me know; that means a lot! I’m glad you love it too. 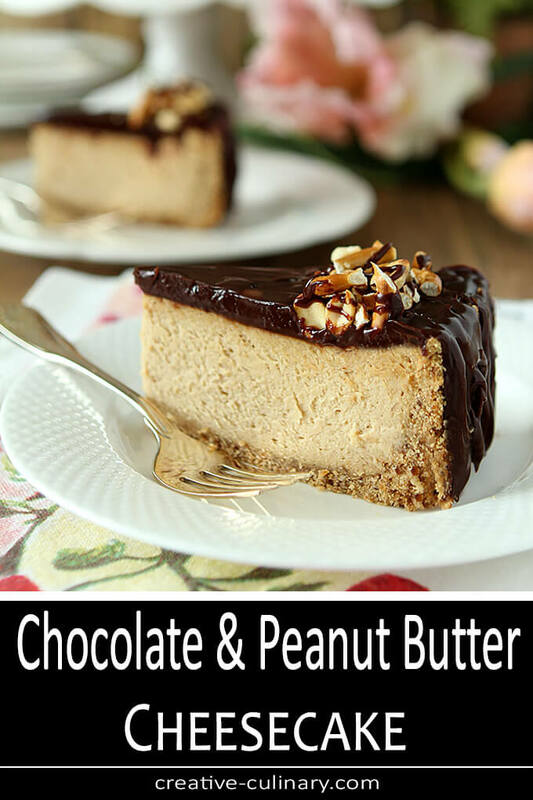 I’m not one to mess with a lot of ingredients in a cheesecake and you’ll most likely never find me turning one into a version of a Snickers Bar…but I have to say…we really loved that peanut butter one too! This looks absolutely amazing, Barb. And while I love pretzels in any form, I agree that when they’re combined with something sweet, they really sing. And this cake of yours is a full-on opera!!!!! I could go crazy over this. The best salty and sweet combo. Gorgeous!! Thank you for the Recipe!! It´s soooo tasty… I love it. Of course, the quintessential chocolate and peanut butter and oh, in cheesecake format, taken up a notch with a salty crunchy pretzel? Seriously dangerous, Barb. Thank you very much! Hate it when you lose power like that! I always use a battery backup — been burned way too often. Our kitty often wants us to come to bed early too, so she can snuggle. Anyway, love cheesecake, and this looks just terrific. Thanks. This cheesecake looks amazing. I love pretzels as a crust for tarts and pies, but I’ve never done the pretzel cheesecake. I’m going to try that for my next cheesecake. And yes, you did do the pretzel proud!! OMG! This looks amazing. I love the flavor combo and the pretzels are perfect. Thanks so much and yes, they added a nice crunch and a touch of salt; a nice update to one of my favorite flavor combos. I am a big fan of the pretzel. And peanut butter. And chocolate. So I’m all over this cheesecake! Delicious! I’m more a fan of the pretzel now…everyone made such great looking recipes I might actually find my mind changed! Did the same to me! I’ve been trying to save the last piece for a neighbor but I might cave today; a girl only has so much willpower and it’s turned out to be a real favorite. I am drooling! One of my favorite snacks is Trader Joe’s Chocolate-Covered Peanut-Butter-Stuffed Pretzel Bites. This combines all those flavors into a delicious cheesecake! Genius! I definitely will take your word for this – that looks INCREDIBLE! I’m good with pretzels in absolutely any form, and this is the next form I want to try. Thank you Heather and special thanks for a great theme; it’s so fun to see the wide array of treats that come from our imagination isn’t it? Oh, my, Barb! You continue to dazzle me with your amazing desserts! This cheesecake is no exception!! Thanks Liz. I used to be the dessert Queen; long before the booze one but once my daughters moved out after college, my reasons to make them and my eaters to eat them went with them. I’m enjoying it again since finding those traits in my neighbors. Desserts are such a form of artistic expression and I love the time and effort of building something both pretty and delicious. I know you know what I mean!